The sensual and delicate bloom of the Camelia is the muse. The masterful wood carvings of Grinling Gibbons and the ancient beauty of Indian carved masonry. 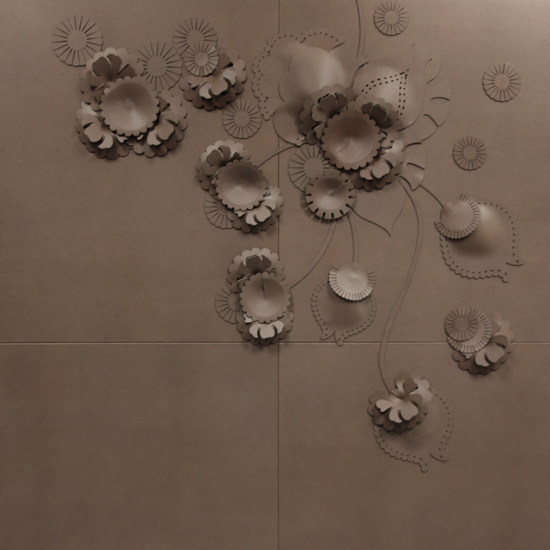 Genevieve, has distilled these elements and inspirations to create an exquisite and intriguing sculptural motif. Complex layers of relief, enhanced by the natural, subtle lustre of the finest leather, responds elegantly with light and shadow to become a unique, textural and very covetable piece. Camelia is as visually powerful as a single panel or repeated to create a mesmerizing and imposing larger piece. 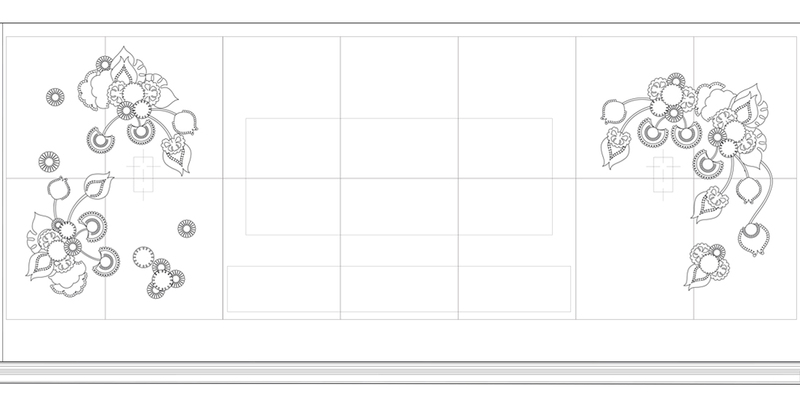 For these, separate, interlocking, base panels are precisely wrapped in leather to form the background. This employs the rarefied craft and experience of traditional leather workers. 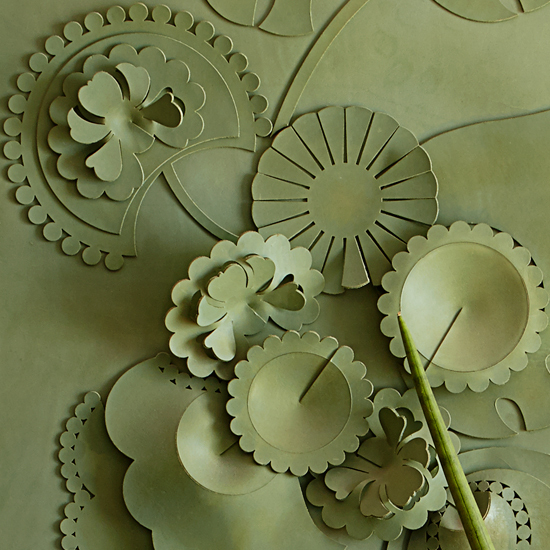 The individual Camelia pieces are then meticulously applied to the surface. It is a collaborative process which symbolically converges artistic gift, creative skill and artisanal expertise. Camelia can be reworked and evolved. Each larger work is a unique response to a client’s exact expression. 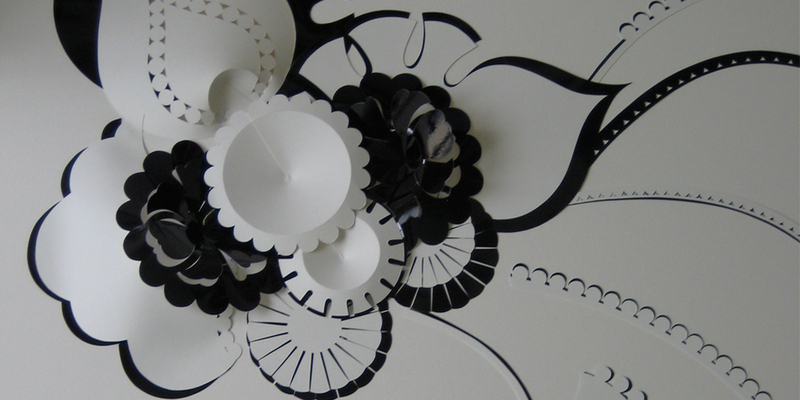 The design can be placed into separate clusters or simpler floral trails for varied coverage. Camelia is crafted from a stringently curated selection of beautiful, premium leathers. Environmental responsibility, sustainability and provenance are observed without compromise. A wide palette of colours and finishes is available. Please contact the studio for details on how to commission work. We appreciate the privilege of private commissions. Accordingly, unless consented, all private commissions are executed and archived in confidence. 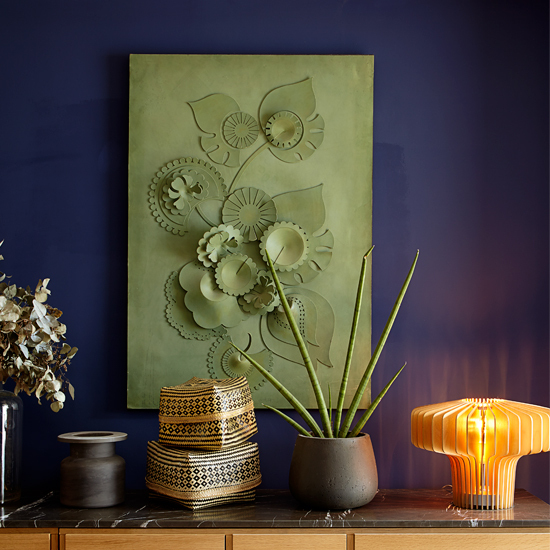 A commission by eminent designer Bethan Gray and her husband Massimo to create two art pieces for their London home. Responding to the couple’s lush, exotic and abundantly planted garden, Genevieve interpreted Camelia in a gorgeous vegetable tanned leather. Using a vivid and deep green, the large leaves and bold flora of Camelia become a powerfully beautiful gesture. The piece, amidst an immaculate curation of art, resides in the hallway providing a charming welcome. The second piece, by potent contrast, is worked in a soft, pale grey that quietly acknowledges the original Stucco architecture. It’s serene elegance and contemplative beauty has found a perfect home in the main living area. Working closely with the client’s interior designer, Genevieve created a vast bespoke piece for the dining room of a private residence in New York’s Upper East Side. 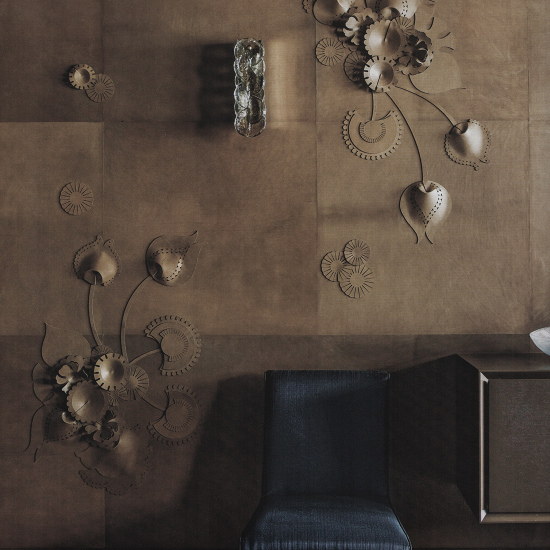 More than 45 sq m of hand-sculpted leather was applied to the facing walls of the imposing room. A beautiful dark grey leather was meticulously applied directly to the wall in large flat panels. 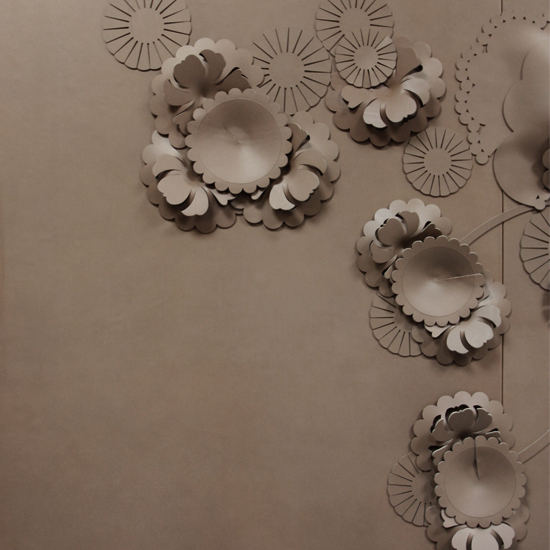 Onto this, hand sculpted Camelia motifs were applied in concentrated clusters around the beautiful vintage lighting. The dark beauty of the leather, the dark wood and hand blown glass lighting in smoked colours all conspire dramatically to invoke an enigmatic opulence with a curiously contemporary elegance. 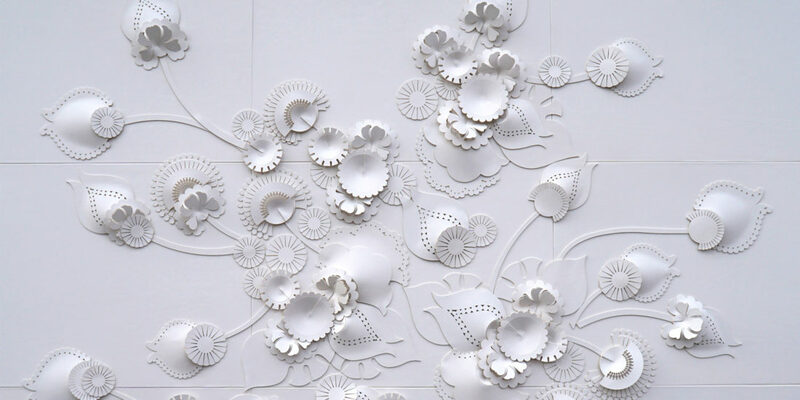 Commissioned by the renowned Richmond International, Genevieve was asked to create a large piece, featuring Camelia, for the prestigious Four Seasons Hotel in Moscow. 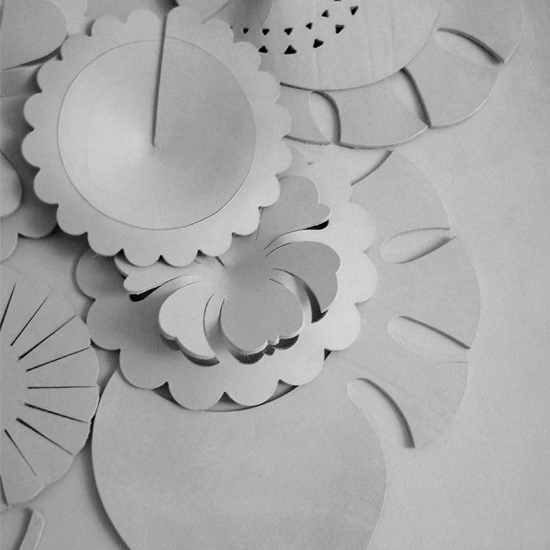 The hand sculpted Camelia motifs were cut from carefully selected premium hides of beautiful leather. A beautiful warm, Caramel colour was selected. The finished pieces create an appropriate, sumptious and warm welcome to this privileged landmark hotel. Commissioned by a private client to create a series of large sculpted leather panels, within the spa area of this stunning private yacht. The panels were rendered in a pure white leather which enhanced the subtle relief and form of the motifs. Commissioned by a private client to create sculpted leather panels for homes in London and Singapore. 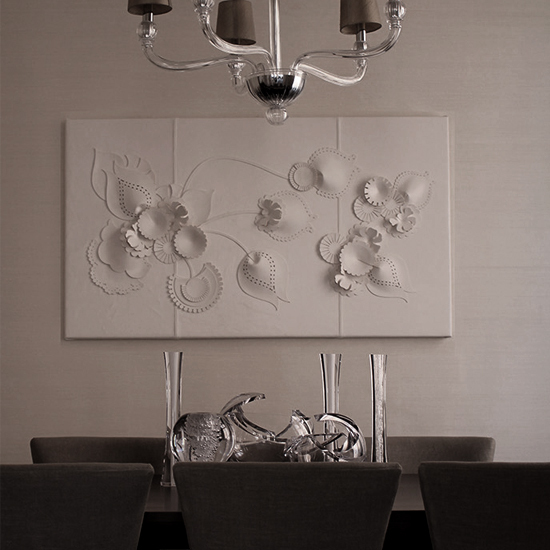 For the residence in Cadogan Square, London, the piece was crafted in a natural pale cream belting leather. Camelia, with its delicate floral form, in this sublime tone, is a subtle reference to the classic Victorian architecture of the elegant mansion block. The piece is a statement of dignified and restrained beauty and is a timeless and cherished centrepiece of the dining room. 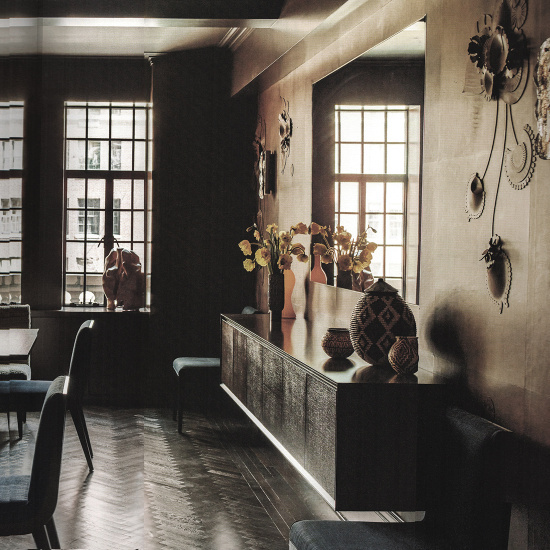 The accompanying piece, created for their Singapore home, was rendered in a beautiful, deep grey leather. The warm, subtle hue creating a gentle distinction and contrast in the pieces whilst retaining a cognitive value. Individually, the pieces are delightful. As a pair they are a subtle and knowing demonstration of exquisite taste. A very privileged commission from the Royal Family of Saudi Arabia. 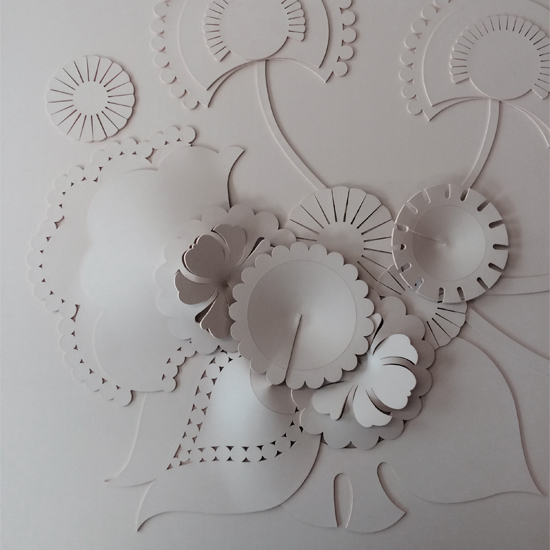 Using carefully selected and very beautiful art paper, the Camelia detail was painstakingly hand cut. Using dramatically contrasting black and white stock, the finished pieces formed a fascinating, sculptural series of studies. Simultaneously visually strong yet structurally fragile. The precious pieces were placed in specially formed clear Perspex museum cases. In this context, the pieces assumed an exalted significance. Disengaged from any practical purpose, Camelia reveals intrigue as an art piece with lasting appeal.